Leave Symonds Yat and head to Goodrich. 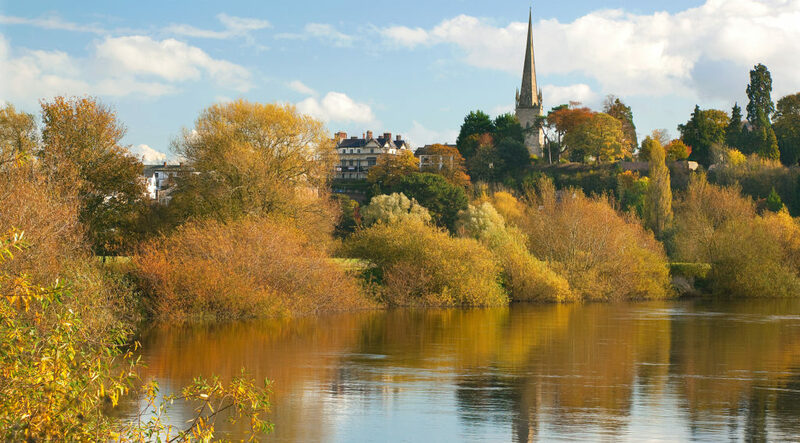 Enjoy the view of the river at Ross-on-Wye before striking out for the cathedral city of Hereford. Pass through Eardisley and pause at Leominster on the “black and white trail” to arrive at Hope under Dinmore and Hampton Court Castle. 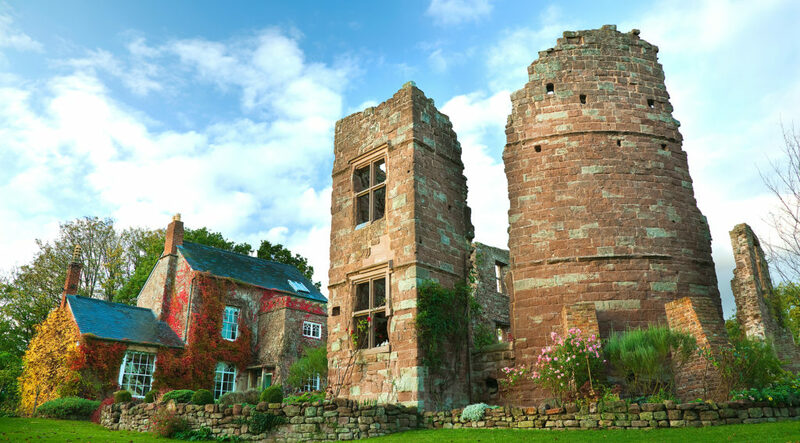 Visit Brockhampton Estate and the Malvern Hills before arriving in Ledbury. The village of Symonds Yat on the River Wye is a popular tourist destination and serves up some great scenery. Use the village as a base to explore the Forest of Dean on foot or by bike, with its wildlife and peaceful nature. 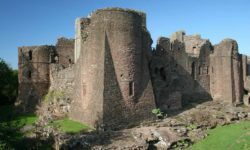 A quaint village where you can enjoy the ruins of the magnificent 12th century Goodrich Castle standing on a rocky outcrop overlooking the magnificent Wye Valley before tucking into a snack in the tearoom. Looking down on the River Wye, Ross-on-Wye is a traditional market town located on a hillside packed with history and is often known as the birthplace of modern tourism. The spire of St. Mary’s church pierces the skyline, with some stunning views from the churchyard. 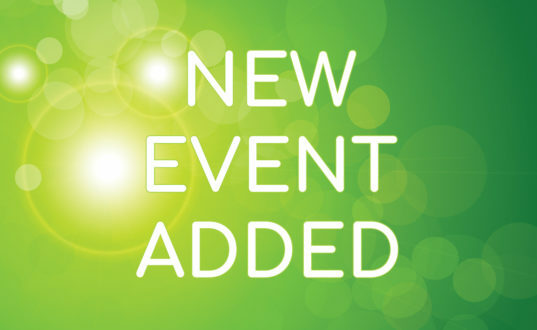 The city of Hereford is well worth spending time in – visit Hereford Cathedral, Hereford Museum & Art Gallery, The Old House and the Waterworks Museum before relaxing and enjoying some of the locally produced food and drink in one of the many restaurants. Part of the “black and white village trail” of historic mainly medieval timbered and half-timbered properties Eardisley in the Wye Valley is an ideal place from which to explore the surrounding countryside, or may be head to Haye on Wye, the bookshop capital of the world. Another village that is part of the “black and white trail” – characterised by Grange Court, Leominster is an ideal location for taking in the countryside and exploring the Marches landscape. Visit the ancient seat of Christianity at the Priory Church of St. Peter and St. Paul. Hope under Dinmore is famous for the magnificent Hampton Court Castle and its stunning sprawl of gardens against a backdrop of the Victorian Walls. Take your time and explore this wonderful building and its scenic grounds. Soak up the 1700 acre Brockhampton Estate where you can amble through orchards, walk through woodlands and enjoy the Lawn Pool. The moated Manor House dates to the late 14th century and is accessible via a timber framed gatehouse. The Malvern Hills dominate the surrounding countryside and reward the visitors with some great panoramic views. Explore on foot, bike, horseback or even take to the skies to see the landscape stretching out before you. At the foot of the Malvern Hills, Ledbury is bustling market town populated with numerous black and white buildings including the Market Hall and is home to the UK’s largest poetry festival. There is ample opportunity to enjoy a local cider tour. 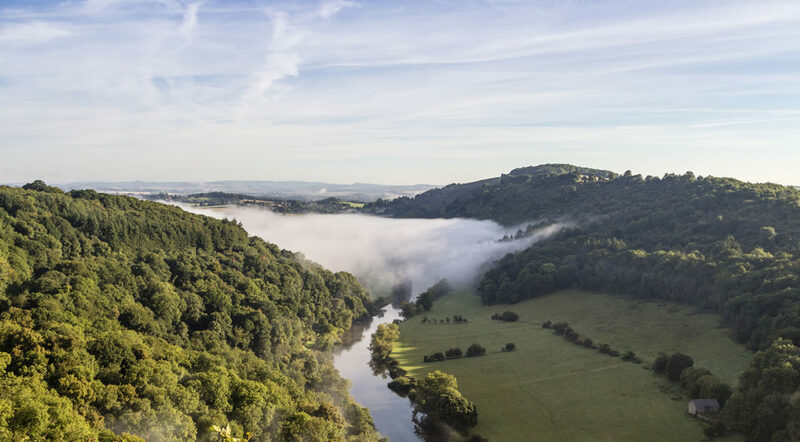 From the peaceful scenic village of Symonds Yat, wind your way to Goodrich to take in the views overlooking the River Wye. 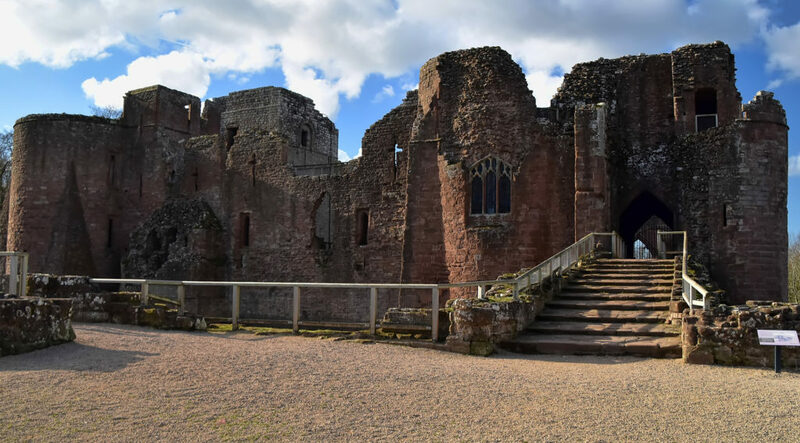 Arrive in bustling Ross-on-Wye to enjoy more views and then head on to the cathedral city of Hereford to enjoy some local food and drink. Pass through Eardisley and Leominster on the “black and white trail” before arriving at Hope under Dinmore, home to the magnificent Hampton Court Castle. Explore the Brockhampton Estate before heading for the Malvern Hills and finally arriving in Ledbury. 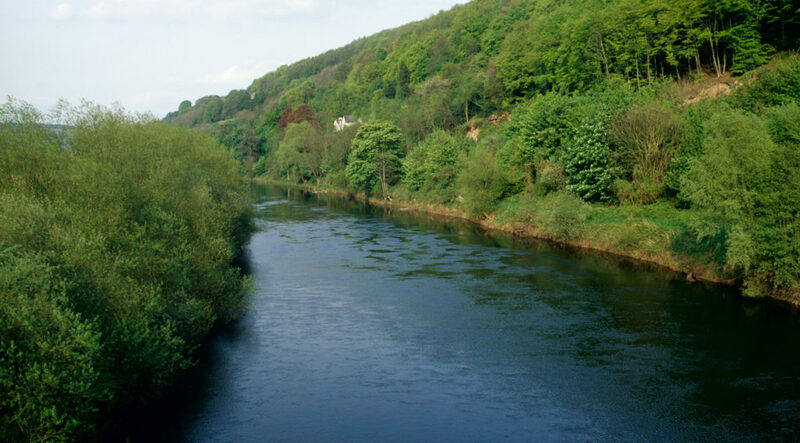 The River Wye carves through the landscape providing fantastic scenery, fun for those in kayaks and canoes, a wonderful home for nature and wonderful backdrop for those visiting Herefordshire. 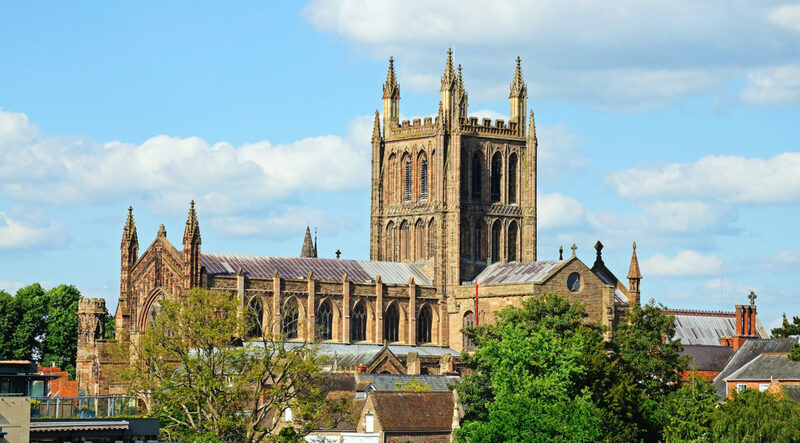 Soak up the history of the county town, Hereford – visitors can take in the Hereford Cathedral and a collection of museums to explore the history of the riverside city. The gardens at the marvellous Brockhampton Estate and Hampton Court Castle are a great way to relax – you can wander the gardens and enjoy the colourful displays and blend of formality and parkland.